Ayurveda means "the science of Life": veda - science, ayur – life. The Science of Life, is a comprehensive medical system that has been the traditional system of healthcare in India for more than 5000 years. This medical system was well established around 2500 to 600 BC, when it evolved into 2 schools: the School of Physicians and the School of Surgeons, similar to allopathy. Around 600 BC. Ayurveda was branched into internal medicine; pediatrics; psychiatry; surgery; eye, ear, nose, and throat; toxicology; geriatrics; and eugenics/aphrodisiacs. In the pre-biblical Ayurvedic origins, every creation inclusive of a human being is a model of the universe. In this model, the basic matter and the dynamic forces (Dosha) of the nature determine health and disease, and the medicinal value of any substance (plant and mineral). The body is composed of 3 body doshas, 3 mental doshas, 7 dhatus, and malas. The harmony among the body doshas of vata (nervous system), pitta (enzymes), and kapha (mucus) and the gunas, or mental doshas (which are human attributes: satogun [godly], rajas [kingly], and tamas [evil]), constitutes health, and their disharmony constitutes disease. The management of illness requires balancing the doshas back into a harmonious state through lifestyle interventions, spiritual nurturing, and treatment with herbo-mineral formulas based on one's mental and bodily constitution. Click Here to take a 3 minute free test to discover your unique Dosha now! 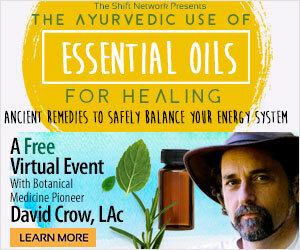 The Ayurvedic Use of Essential Oils for Healing: Ancient Remedies to Safely Balance Your Energy System. Essential oils are some of the most powerful tools in the Ayurvedic practitioners toolbox for restoring health, balancing energetic types (doshas) and optimizing your life force (prana). The simple daily use of these oils can have a profoundly positive effect, bringing you more balance, harmony and vibrant health. I’m excited to invite you to a complimentary virtual workshop with botanical medicine pioneer David Crow on Wednesday, April 5. In this FREE online workshop, he’ll share what’s important for each Ayurvedic energetic type, or dosha. Plus, you’ll find out about maximizing some of David’s favorite essential oils, which include rose, vetiver, sandalwood, agarwood and jatamansi!